Pop star rihanna early this morning escaped fire from a London Hotel .London Fire Brigade says she was among 300 people evacuated from conrinthian hotel after an early-morning fire in an elevator shaft. 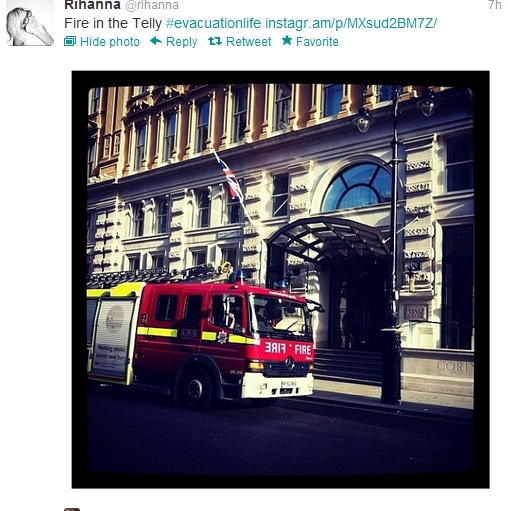 The talk that talk singer tweeted news of the fire early Wednesday to her 21 million Twitter followers, posting a picture of a fire engine and the words: "Roamin da streets since 6am! Fyah in da telly." In other news RiRi has now sold a staggering combined total of 20 million singles and albums on UK turf, according to the latest Official Charts Company's sales data.The 24-year-old singer has sold over 14 million singles and over six million albums in the United Kingdom. Rihanna performed Sunday at the outdoor BBC Hackney Weekend in London.